Greg has over 14 years’ experience in the construction industry. As a second-generation builder, he completed his carpentry apprenticeship then gained his own builders licence. Greg established his own building company and has become one of the areas’ leading and most sort after builders. 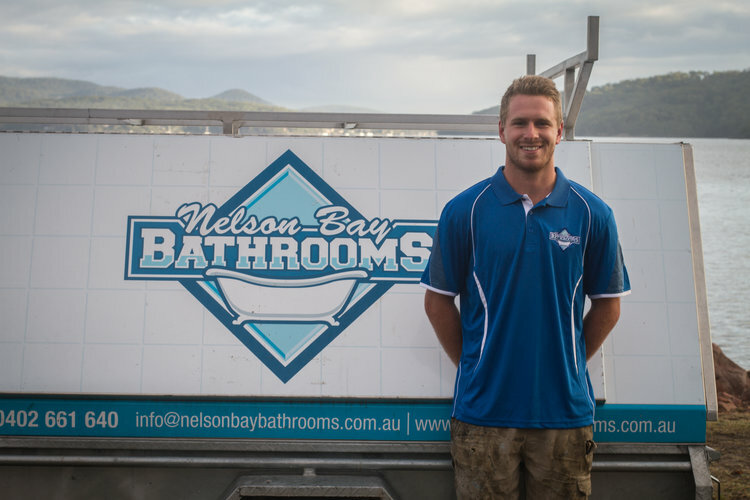 His drive and passion for building has seen Nelson Bay Bathrooms become industry leaders in bathroom renovations in the Nelson Bay & Port Stephens area, completing on average 35-40 bathrooms a year. Always striving for the best quality and testing the boundaries in construction and his willingness to take on intricate jobs that many builders may shy away from has fuelled his passion for discovering new ways and products to work with to achieve the best possible outcome for his clients. Combining his extensive experience, training and attention to detail will ensure that your build will adhere to the very highest standards. This is proven as Greg has built Nelson Bay Bathrooms and his team into an HIA and MBA award winning team which is highly sought after by clients and architects. With her years of experience both home and abroad, Shelley runs our entire office administration side. She keeps our company running smoothly from the back end working closely with Greg and staff to ensure all jobs stay on track. When Shelley isn't tackling our books you'll find her on the tennis court or co-ordinating her three kids and their various activities. Aaron runs our sites as a hands-on Site Foreman, dealing directly with Greg, clients and the architects to ensure the construction work for our projects are completed to the highest standards. With over 30 years’ experience in the construction industry he has a keen eye for detail whilst being able to liaise with clients to make sure they know what’s happening every step of the way and they can rest easy knowing that their project is in safe hands. When he's not onsite you'll find him playing football down at the park with his two boys or with his feet up next to the fire relaxing with a beer. Growing up on the coast, Ryan's a surfer boy at heart in the weekend and he brings a fantastic work ethic and great eye for detail which makes him a valuable part of our team. He works closely with Aaron and Greg, clients and architects as one of our hands-on Site Foreman managing the day to day works to ensure our core values and high standards are always at the forefront in everything we do. When he's not onsite you'll find him getting barrelled down at the local break or ripping into a cracking woodfired pizza at the local country club. Troy originally joined the team as a part-time labourer, often referred to as the human excavator, he has quickly earned his stripes as the company’s hardest working apprentice. With a father and older brother who are both carpenters, he has been quick to pick up the skills and start developing into a highly skilled apprentice who is meticulous and shows a strong work ethic. When he’s not hitting nails or demolishing houses you can probably find him in the gym or buzzing around the bush on his dirt bike. After starting his apprenticeship in frames and trusses, Todd decided that jumping on board with the Custom Built Team would be a better step towards his goal of becoming a builder. With an interest in learning all facets of building from the ground up to handover, Todd works with our foreman and Greg to make sure that the Custom Built teams’ strive for excellence is always at the forefront. Outside of work you’ll probably find him at the beach shredding the waves or knocking the top off a couple of frothies down at the local pub. Lachy returned home from a trip overseas with a strong vision and passion to become a builder and joined our team as a hard working and enthusiastic apprentice. Lachlan has started to gain motion to evolve into a great carpenter with a strong ambition and good eye for detail. When he’s not at work, you’ll probably find him in his garage working on his car or swimming about the ocean taking photos.